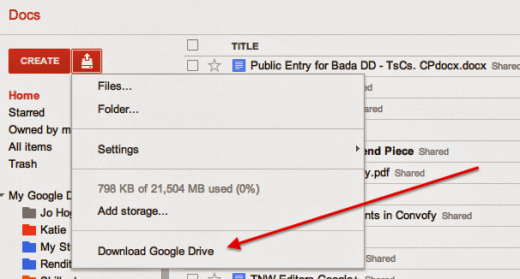 It's All My Blog: Google Docs begins to get Google Drive integration. Here’s how enable the hidden option. Over the past five years, rumours have circulated that search behemoth Google has been working to roll out a new Cloud storage service called Google Drive, allowing users to store their documents, media and data online, similar to popular Cloud platform Dropbox. Reports that the service is to launch soon have been given a huge boost after Brazilian technology website Gemind managed to unlock hidden references to the service in Google Docs, detailing steps to enable a “Download Google Drive” option within the website itself. The option looks to only be available to users with the correct privileges, maybe Google employees, but it may allow Google users to download an application to sync their entire Google Docs archive to their new Google Drive account or vice versa – when it launches. When clicked, the ‘Download Google Drive’ option doesn’t instigate any website actions, instead taking you back to the main document list. Open Google Docs and then open Developer Tools (View -> Developer). Click the ‘Scripts’ option on the top bar of the Developer Tools and ensure the current file is ‘program’. From here, search for config ['cookieFetchElement'] (typically line number 365) and then click the line number in the sidebar to effectively ‘lock’ that code instance and turn it into a breakpoint (it should show a blue highlight). You should now see that the code remains the same but the website has locked at the point you specified. Head back to the ‘Scripts’ window and then press the play button on the right hand side. The code should load and you should be able to click on the upload option next to ‘Create’ button. You should now have the option enabled; you can’t do anything with it but it could make you feel warm and fuzzy inside knowing that it is already in Google’s code, ready to be launched. Techcrunch recently posted that Google Drive test pages had started to appear in Google’s search results, further reinforcing rumours the service could be launching imminently, leaving it purely in the hands of the search giant to announce when its long-rumoured, now almost official Cloud storage service will launch.